Women Polytechnic Colleges. There are total 68 Vyakhyata vacancies available in JPSC Recruitment of Govt Polytechnic Colleges. 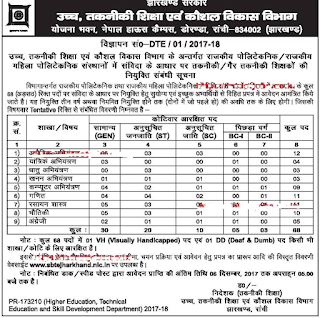 Selection for these lecturer/Vyakhyata vacancies will be held based on GATE Score for Engineering Subjects and SET/SLET/NET score for Humanities Subjects. 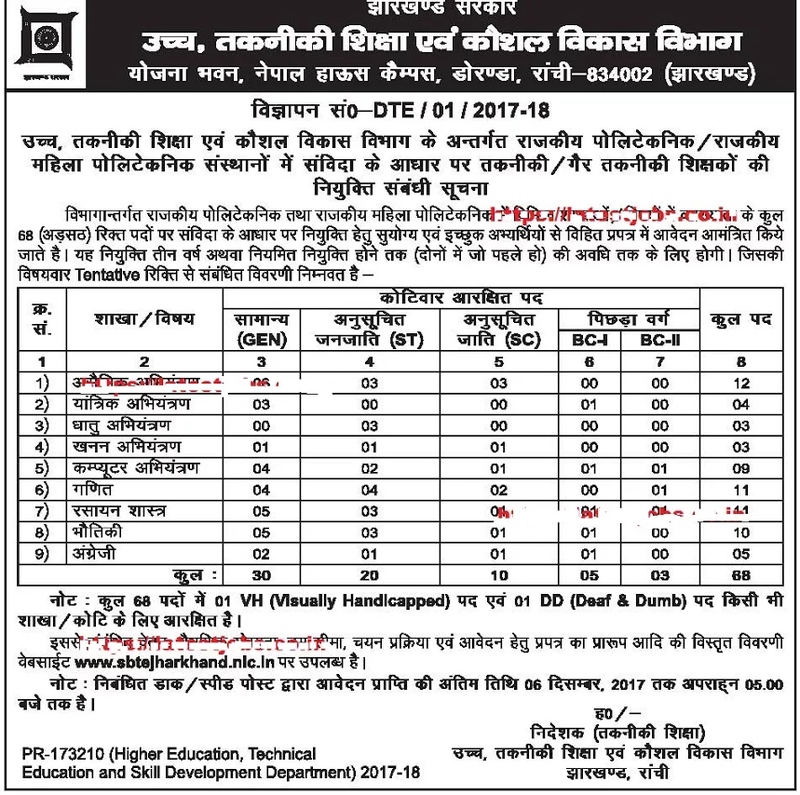 Last date for submission applications for this Vyakhyata jobs is 06-Dec-2017. If applications are received less than 3 times of GATE/SET/NET qualified candidates then a written test will be conducted. 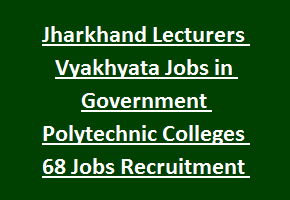 For more details regarding Vyakhyata/Lecturer Jobs of Jharkhand Govt Polytechnic Colleges see the below given details educational qualifications, age criteria, application procedure and more information is given below. Download Official notification here for JPSC Vyakhyata/Lecturer Jobs in Govt Polytechnics. There are total 68 vacancies available in this current recruitment of Jharkhand Govt, Government Women Polytechnic Colleges Lecturers/Vyakhyata posts. Subject wise vacancy details are given below. Candidates age limits as on 01-08-2017 22-35 years for general candidates. For OBC candidates 22-37 years, Female OBC-22-38 years and for SC/ST candidates 22-40 years. Candidate can pay the application fee through SBI I Collect using Credit or Debit card or using Net banking. Rs.600 for General and OBC candidates and Rs.150/- for SC/ST candidates. If GATE/SET/SLET/NET qualified applications received more than 3 times of vacancies then selection will be based on educational qualifications and if 3 times lesser applications came then an objective type written test will be conducted for 50 marks with duration of 2 hours and 100 questions will be given form subject domain knowledge. Objective Type written test will be conducted for 50 marks. Exam Duration is 2 hours. Candidates who are willing to apply for Jharkhand Polytechnics Colleges Vyakhyata/Lecturer jobs can submit their application form online through the official website of jpsc.gov.in. Filled application form along with self attested copies of all testimonials to be reach to the SBTE department is on or before 06-12-2017.